Ed and I got married in May 1998. 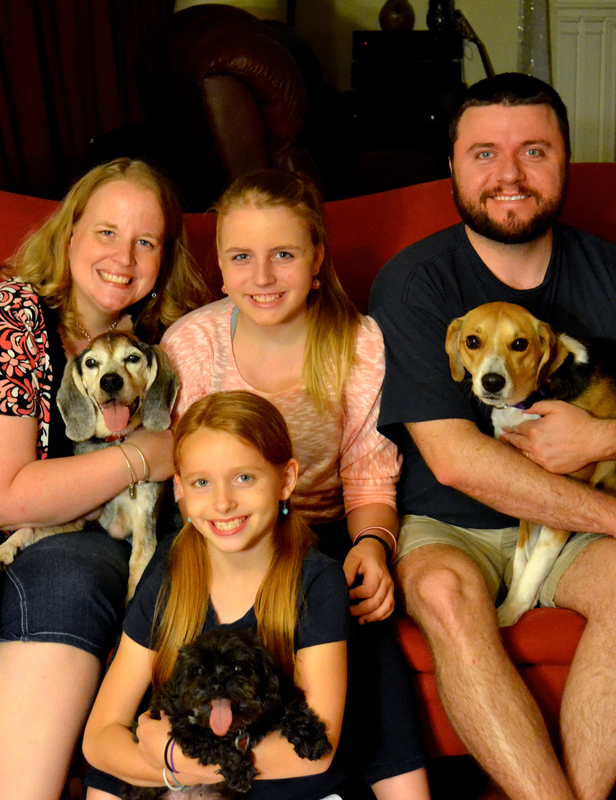 Like many newlyweds, it wasn’t long before we started talking about adding to our family by adopting a dog. We bought a dog breed book and tried to determine what breed would be the best fit for our lives, especially since we lived in an apartment at that time (this was before Google, and yes, that makes me feel old). 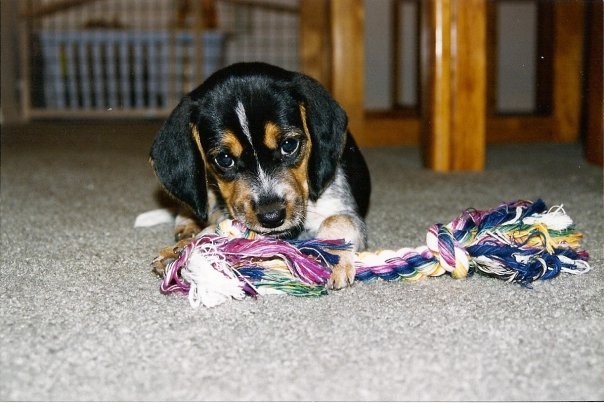 We decided we wanted a beagle puppy and started watching the ads. 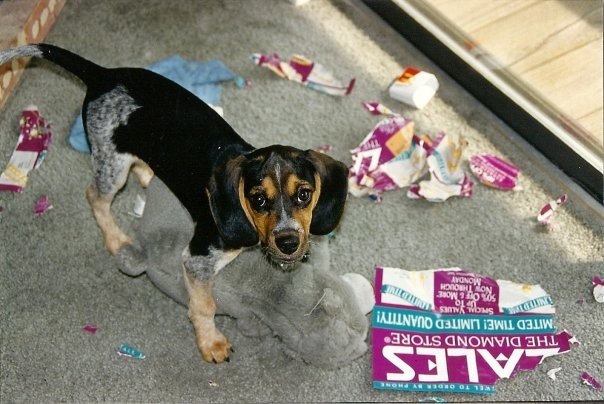 It wasn’t long before we answered an ad for beagle puppies in Fuquay-Varina. We made the drive to meet the little bundles of fur and enjoyed playing with them and watching them tumble all over each other. They were all adorable but the one they called “Spike” (because of the white streak on his forehead) was the one that captured our heart. 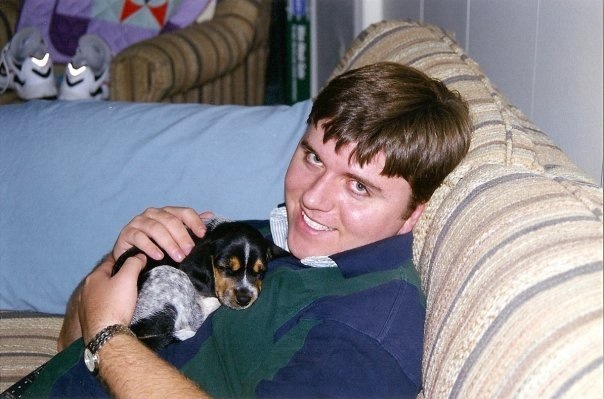 When he was 6 weeks old, we renamed our puppy “Copper” and proudly brought him home to join our family. The name “Copper” seemed appropriate for three reasons. 1) His mom’s name was Penny 2) we loved Copper from Disney’s “The Fox and The Hound” and seemed doubly appropriate later after we went to 3) Copper Mountain resort in Colorado where I learned to ski with Ed’s family. His full name was actually “Copper Mountain Page” and his kennel boasted a sticker from the ski resort. 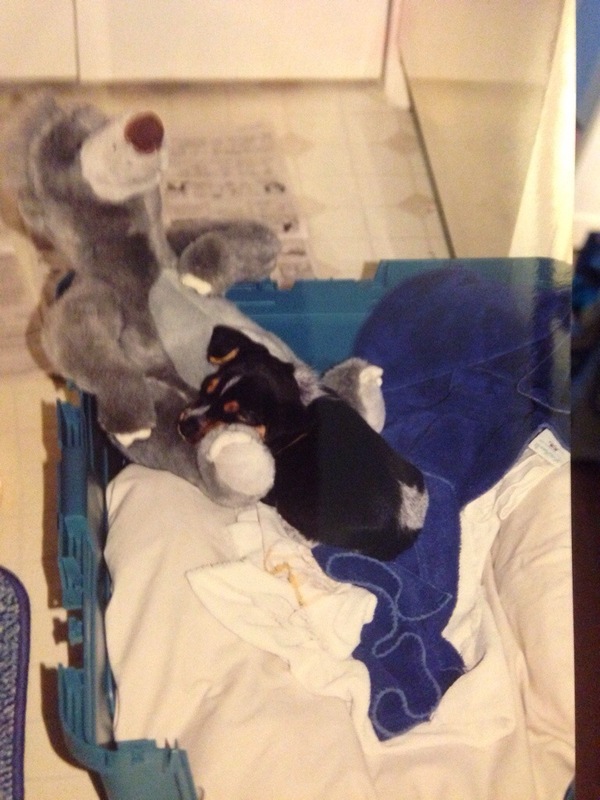 The Dog Breed book had been replaced with a “Caring for your Puppy” book and so we felt pretty proud of ourselves that we were ready that night with a great kennel filled with soft blankets, a big stuffed animal, a ticking clock, and even a hot water bottle. We played with Copper and snuggled him to tell him goodnight and went off to bed secure in the knowledge that we had tired him out and his decked out kennel would be everything he needed to settle in and go to sleep. Wrong. The pitiful crying and whining started before we even made it down the hall. Still, we didn’t want to spoil him by reacting right away so we got ready for bed and thought he would settle down. Wrong again. We finally relented and brought him to bed “just for the night” because he was a baby and was missing his mama and siblings. My sweet Copper curled up under my chin and went to sleep. 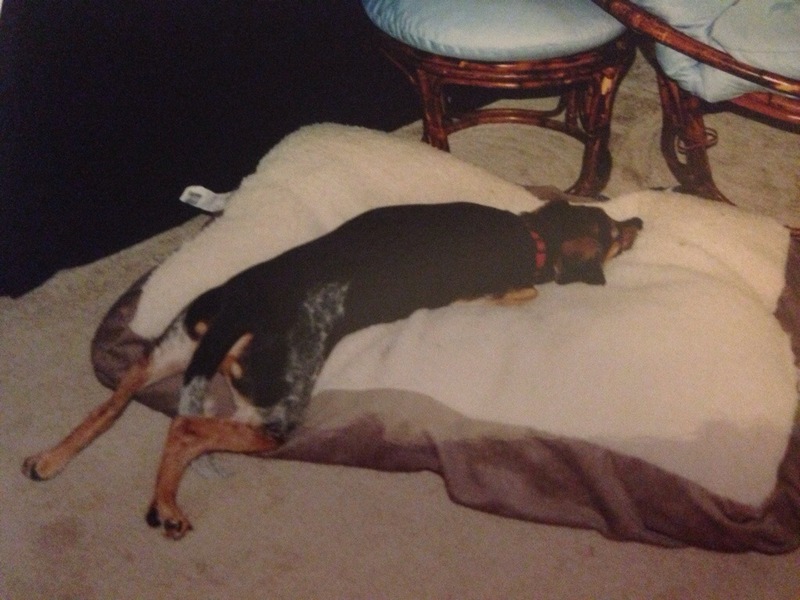 Of course, he never made it back to his kennel for bedtime and continued to sleep with us for the next 15 years until his health got to the point where he couldn’t get on and off the bed anymore. We enrolled Copper in puppy training and he successfully graduated knowing the basics of sit, stay, lie down, and heel. Of course, since beagles are ruled by their noses, the heeling was pretty much limited to the confines of the training facility. Once we were outside, he just wanted to pull ahead to follow all those fabulous smells. We also taught him how to shake, give a high-5, dance, and roll over. I was most proud of teaching him to not lick faces. 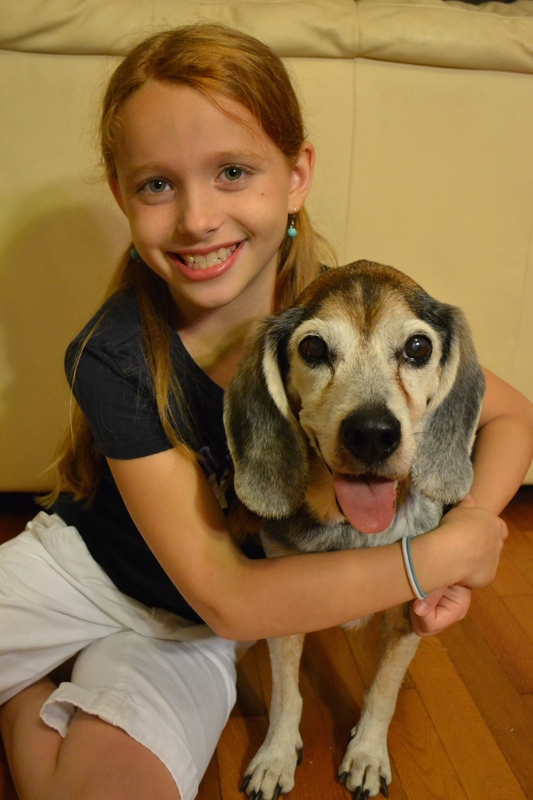 I HATE having a dog lick my face – lick my hands, my arms, my legs, just please don’t lick my face! We doted on Copper and enjoyed taking him to the dog park, the beach, and even to a dog-friendly bed and breakfast. 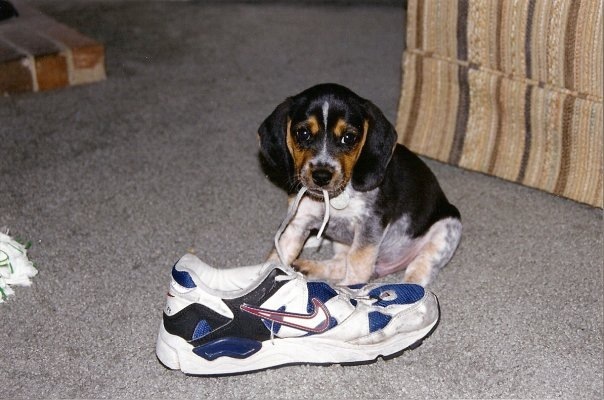 Like all puppies, Copper loved to chew. Shoes, papers, books, stuffed animals, nylabones, and most notably, our papasan chair cushion. That was not a pretty sight. As we started talking about having a baby, we decided that Copper needed a playmate. Ed really wanted a lemon beagle so we once again watched the ads. Ed found a 1 year-old lemon beagle mix that a family had decided to rehome. We drove up and “Rosie” was standing on top of her dog house. I think we probably fell in love right then. We brought Copper along to make sure they would get along and “Rosie” immediately got down on her belly and slid on her belly towards him. 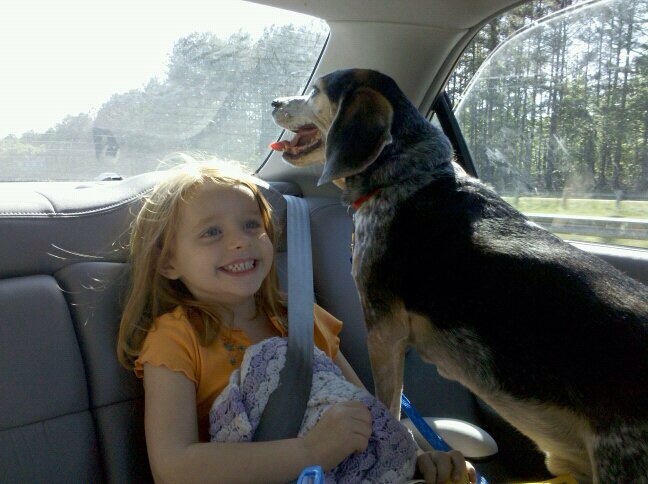 She was submissive and sweet from day 1 and she was excited about her new friend. We renamed her Daisy and since the names sound similar, she had no problem learning her new name. 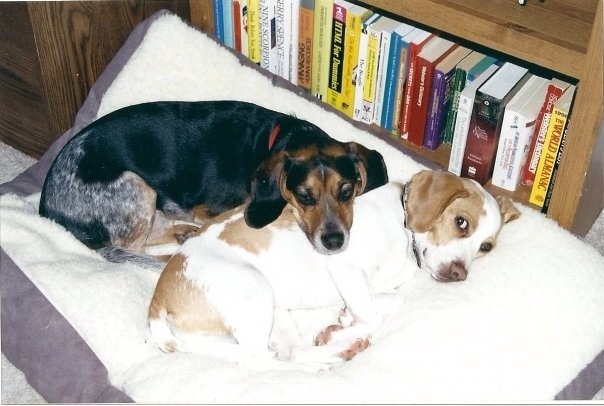 Copper and Daisy were great friends and never aggressive towards each other. 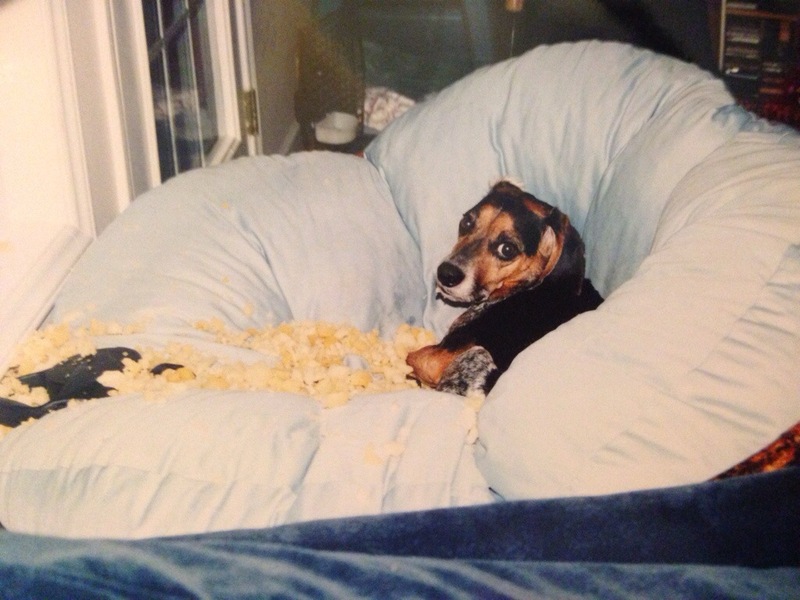 We have lots of pictures of them curled up together in the papasan (before Copper ate it) or on their dog bed. 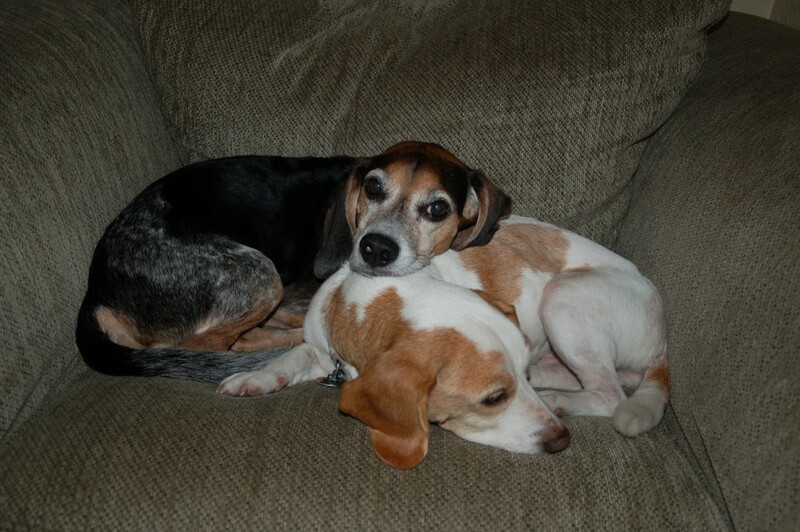 More often than not, Copper was resting his head on Daisy’s back. The next addition to our family was Hailey. We again took to books and read that you should take a pillowcase to the hospital to put on the bassinet mattress so that is exactly what we did. We kept it on overnight to get Hailey’s scent on it and then Ed took the case home to the dogs. Daisy was always happy-go-lucky so we weren’t concerned about how she would react but I was concerned about my first “baby” and how he would take not being the center of my attention. The thing that sticks out in my mind is that he was so out of control hyper and excited that we had to put on his head collar (what was the equivalent to him of a “cone of shame”). It fit over his muzzle and then attached to a leash. 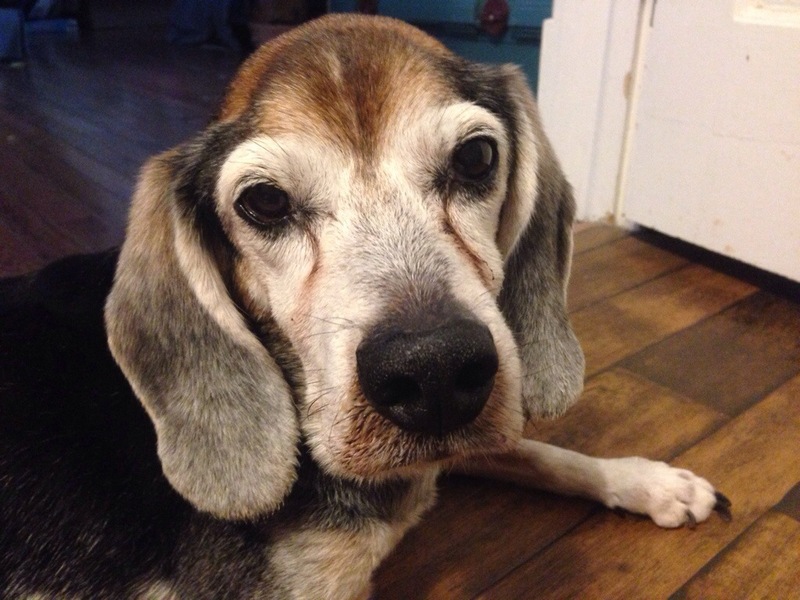 He could still open his mouth and eat and drink but it was designed to make dogs not pull on the leash so much (remember, beagles are ruled by their nose and will just pull you along for the ride). This contraption humiliated Copper to no end and not only did he immediately calm down, but he positively sulked. It was pretty pitiful. 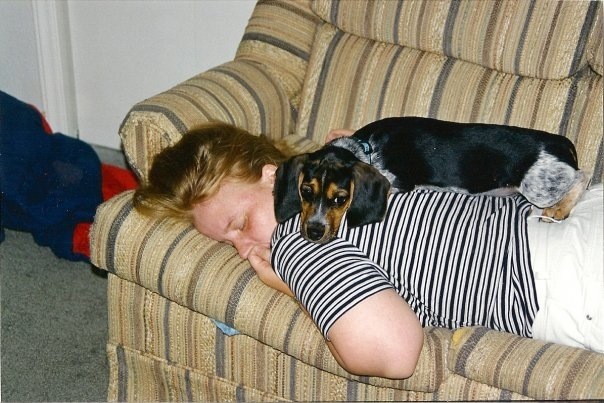 Copper loved to sleep. 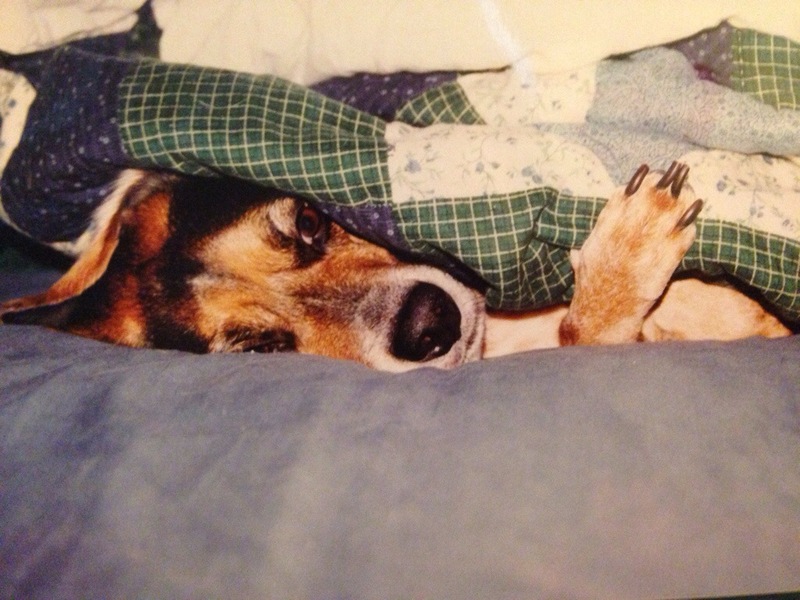 He almost always slept curled up next to me and would paw at my covers until I lifted them high enough to let him under. When he got older and his sinuses started acting up it was a maddening cycle. He would paw at the covers, crawl under, turn around, start hacking and sneezing, get out from under the covers, then turn around and paw at the covers to come back under. We used to joke that copper thought he was a cat. He would wait for me to get settled somewhere and then he could jump up and put his head in my lap or on my leg. If I was on my side on the couch, he would jump up on my side or lay behind me and put his head on my side. If I would nap on my stomach, he would nap on my back. He loved to be close and I loved having him right there with me. Copper also loved visitors. He would dance and prance around for attention and for someone to rub his ears. His favorite visitors were my mom and dad. He couldn’t wait for my mom to sit down so that he could climb in her lap and he couldn’t wait for my dad to slip him some food! 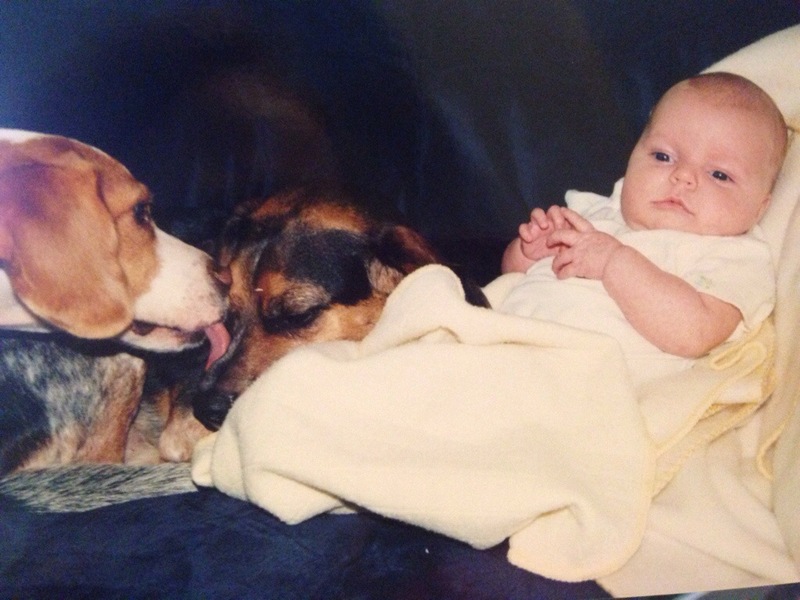 When my mom helped me at the house when my girls were born, Copper was thrilled to have her there so that he had someone to give him the attention he thought he was lacking. Of all of his favorite things though, nothing compared to food. That dog LOVED to eat. I swear that his passion for food is the only thing that has kept him alive these lst few years. He literally LIVED to eat. We didn’t give him table food often but pizza crusts were one of his favorite things in the world. He knew that pizza smell and would bark and bark and bark long after the pizza was gone. As long as the aroma was still there, he assumed we were holding out on him and demanded that we share. Popcorn was another treat he enjoyed and I enjoyed throwing it in the air for him to catch. Until his eyesight failed him, he was a master at catching food mid-air. I think he was motivated by not letting any of the other dogs get to it first! When we knew his stomach was feeling uneasy, Ed would make him rice and he would gobble the whole bowl in a couple of bites as if afraid that we were going to change our minds and take it away from him. Copper was also very, very sneaky when it came to food. It was never a pretty sight to come home or wake up in the morning to a knocked over trash can. He would also knock over the bin of dog food by the back door that would not only allow him to eat himself sick but would also more often that not block us from being able to open that door. We came home once to white powder EVERYWHERE…a Visalus shake mix bag must have been too close to the edge of the counter. We heard a crash one day and he had gotten ahold of the strap of the insulated pyrex carrying case and brought down (and shattered) a pyrex dish of blueberry cobbler. Thank God he was okay because he was scarfing down that cobbler as fast as he could, glass and all. He is also fortunate to have never been killed by chocolate as the girls found out the hard way that if they left their Halloween candy within his reach, he was going to find and eat every bite. We also lost multiple Thirty-One thermal totes because they were left in his reach after school with leftovers still inside and he ate right through them to get to what was inside. In fact, he once ate through one of my display thermals even though it had NEVER had food inside. He must have been really hungry that day. I have endless stories of Copper getting into food he shouldn’t have but my favorite is the day that we came home and he had gotten into the pantry (he would paw at it until it jumped back enough that he could get his nose wedged in and open it. We had to start propping something in front of it to keep it closed). That day he ate part of a box of Zatarains and OPENED and ate a CAN of refried beans. 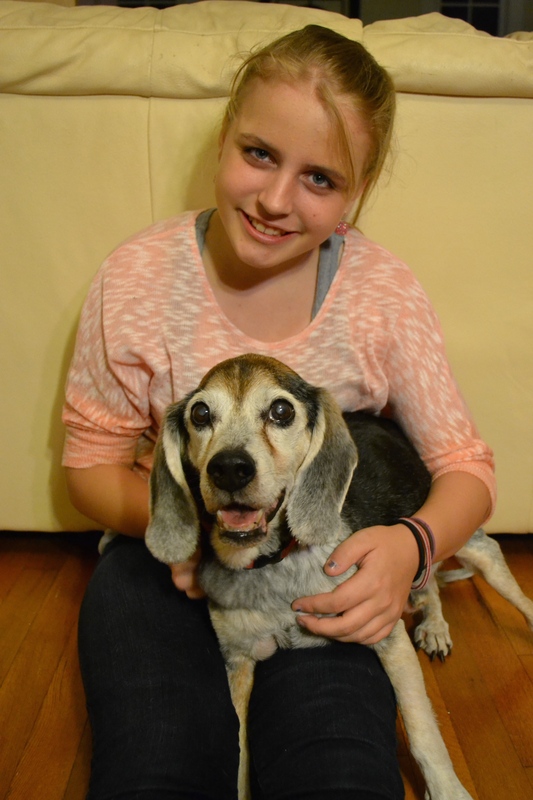 It had a pop tab but still…that dog was 15 years old and managed to eat through an aluminum can! Every time we brought home a new rescue cat I felt like Copper gave me a look like, “really? another one? what did I do to deserve this torture?” However, Copper had an unusually sweet relationship with Fred and it was the main reason I hated having to make Fred an outside cat. 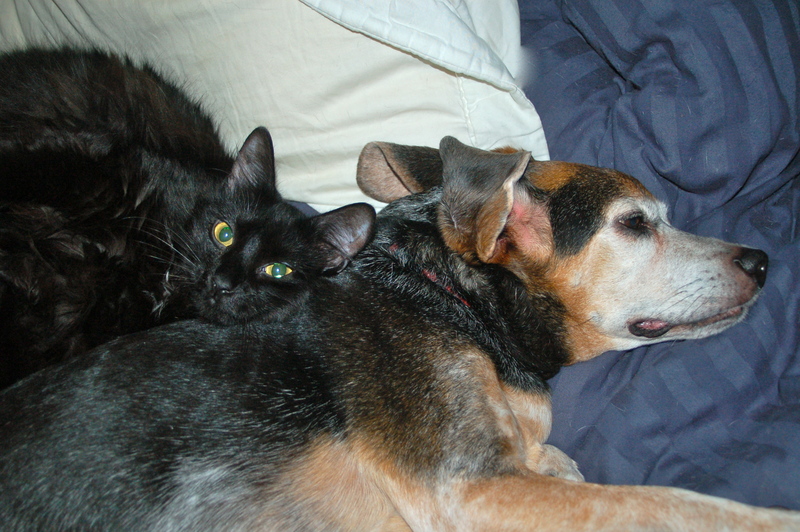 Whereas Copper had no use for Penny (our other beagle-mix that we got as a puppy after Daisy passed), he and Fred the cat would curl up next to each other to sleep. 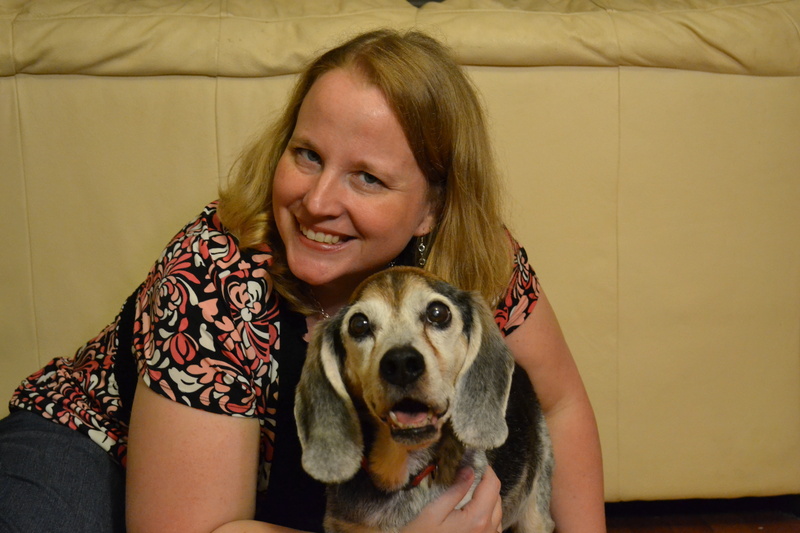 We have so many great memories of our time with Copper and I sometimes feel guilty that my selfishness at not wanting to let him go meant that he struggled more and more over the past few months with getting around, with seeing and hearing, and with incontinence. I hope and pray that he wasn’t suffering during this time and I am thankful for the fact that I had more time with him than I expected to have. Although he hasn’t been that same puppy who slept under the covers with me and followed me around, he still got all excited at the sight of a milkbone and barked like crazy at the smell of pizza. I gave him lots of treats today, including a peanut butter sandwich and a cheese stick for old time’s sake. I only wish I had thought to order a pizza. 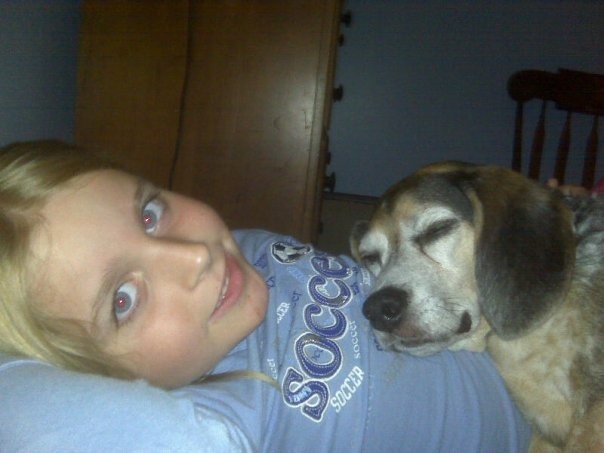 I’m going to miss that dog. Goodybe, my friend. 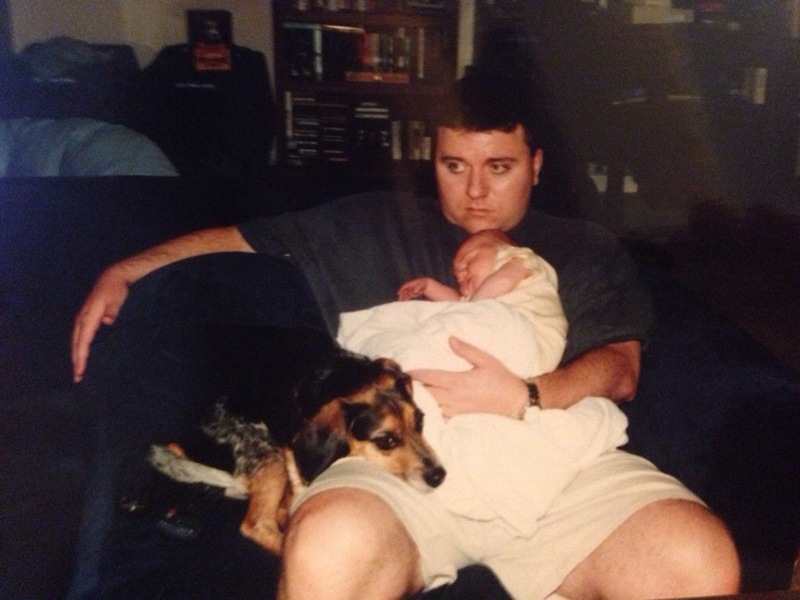 Thank you for being a part of our lives and our family for 16 years. You will be missed. I have been married to my husband, Ed since 1998. We have two daughters, Hailey (9) and Leah (6). I have been the Director of Easter Seals UCP Stepping Stones Children's Center in Sanford since 2004. I am an Independent Senior Director for Thirty-One and I absolutely LOVE it! I was raised as a Wolfpacker but saw the light and now I bleed Carolina blue (sorry, dad). 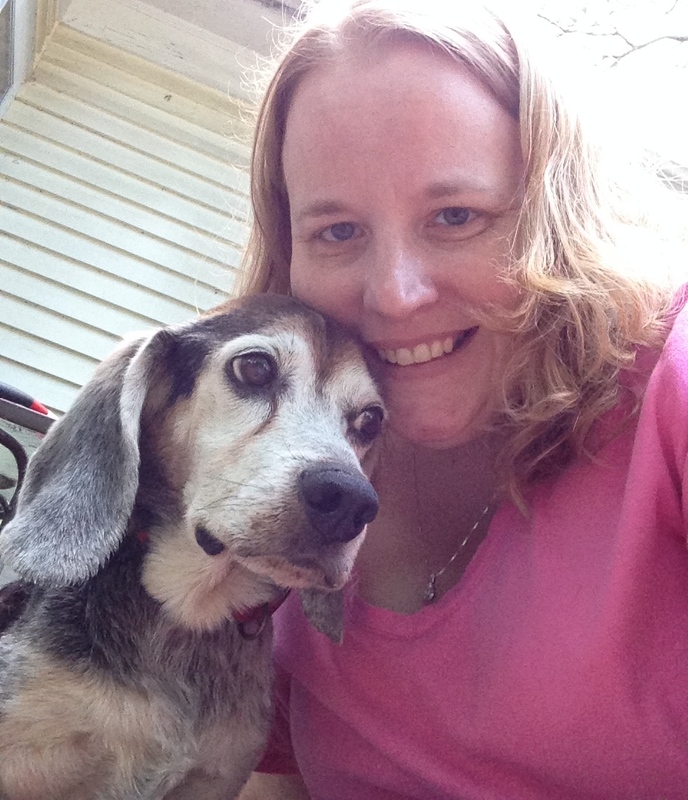 This entry was posted in Thirty-One. Bookmark the permalink. Emily; you are so eloquent. I so enjoy reading your blogs but this one touched me the most. 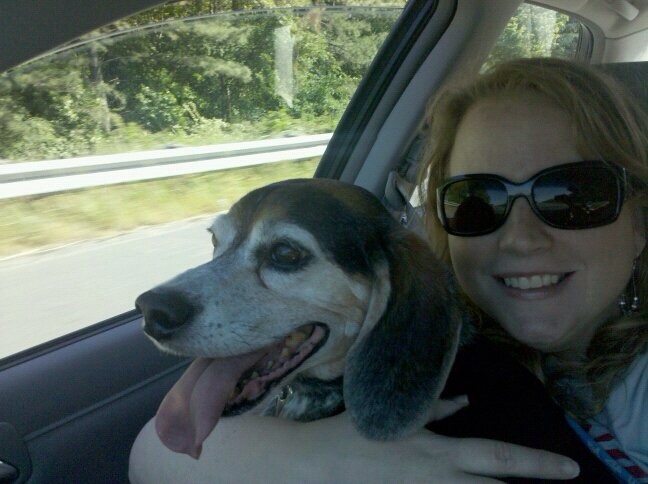 Rest in Peace Copper! and love and prayers to you and your family. thanks for sharing this story with us.